old school or just deadly? Discussion in 'Lights - Store Bought and Home Made' started by penguineer, Oct 17, 2012. I'm in the process of clearing out some storage spaces that have been collecting "stuff" for a while and I found a few strings of "old school" lights. When I started doing the static display a few years ago my parents would occasionally give me sets of lights that they found at garage sales in case they were any use to me. The coloured pieces of plastic are a sort of "star sleeve" that fits over the bulbs to give a star/twinkly effect. So - should I just dump them or is there part of them that is any use for the future? I too have a few of these type of light sets, a few like the ones you photographed, but coloured light bulbs vs coloured lenses (the covers hurt if they fall off and you step on them!) and one with bell shaped covers instead. Some of them were just static while some had a flashing bulb. They were all inherited from my great grandma. I used them on the window seals inside until 2006 or 2007 but no longer use them as there are other low voltage safer, brighter and more interesting lights to use now. 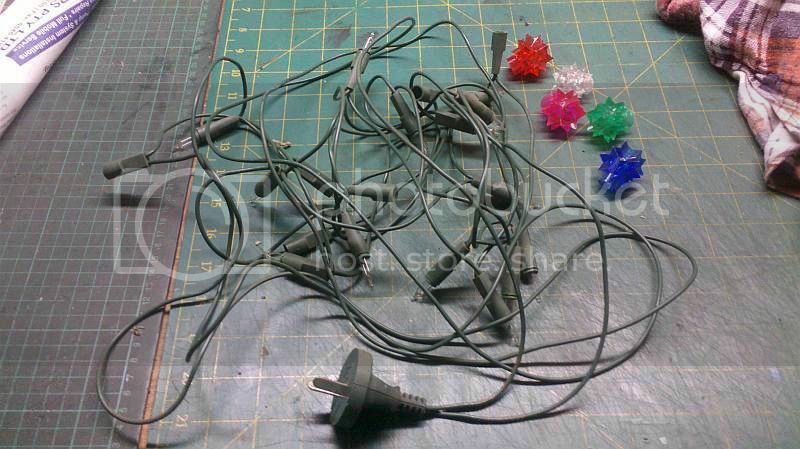 These light sets were made to put on the artificial Christmas trees - they are strictly indoor use only. These were mainly used for indoor christmas lighting and used on trees, i actually still have a set here that are just like that. Yeah - figured indoor/sheltered was the best place for them. I'm not sure I'd like them in the house though when there's plenty of cheap LED options out there. One set did flash when I plugged it in, but I'm not convinced it was part of the original design. I'm thinking the best place is the bin - most of the sets don't light up at all. Yes this is an outrageous bump, however this thread took my interest. Basically I am desperately seeking a set of lights just like those starbursts that still have the filament leader flashing bulb, Just one set, I know they are inefficient and probably not all that safe however I have a certain nostalgia for the odd timings that are provided. Just for my tree. Could anyone point me in the direction of where a set of these might be available? pref with 50 or 100 bulbs, as a youngster I loved our 20 pc Edison screw in set but I have marginally modernised. Im not sure where you can get these old ones from except from garage sales. I have noticed a lot of the new technology are starting to imitate the "classical" light bulb. Have a look at some of the LED's with C9 covers. They look old school but are much safer.